Handmade pasta, proper pizzas, traditional Mexican snacks, a burger-topped Bloody Mary, and everything else you're going to want to try. With so many visitors to Universal Orlando making a beeline for all the food (and all of the butterbeer, and the butterbeer-flavored things) inside The Wizarding World of What's His Name, followed maybe by some quality time with The Simpsons and their let's-hang-out-here-forever Fast Food Boulevard, the gaggle of really good restaurants sitting right at the gates, inside Universal's CityWalk, are sometimes overlooked. Understandable? Sure. The right thing to do? Not at all. Opened at the turn of the century with a handful of familiar brands, Universal has put an extraordinary amount of effort into upgrading the food at CityWalk—a focal point for the massive resort, which just opened a sixth hotel this summer—in recent years; currently, there are roughly a dozen sit-down dining venues to choose from, right inside CityWalk, and it’s taken them years to get things to where they are, and if you ask the men and women behind the curtain, they’ll tell you, without getting very specific, that they’re not even close to done yet. Exuding a certain Times Square-esque energy, and feeling every bit the tourist trap, CityWalk may not grab the uninitiated as the sort of place to uncover great dining finds, and yet it is—here are just a few things you need to know, before you go, about a few of the places you need to try, and what to eat when you finally get there. Unless you’ve got your heart set on a specific meal inside the parks, eat lunch at CityWalk. Sure, getting in and out of the park can take a minute, but this isn’t the House of Mouse, it’s never going to be as much walking as you think, and there’s so much to eat here. We’ve seen half-empty restaurants at lunch time, making for a leisurely break in the middle of your day, which in Florida, if you had not heard, can be quite hot. Once you’ve ticked off your faves in the parks, you'll find that some of the best food at Universal is right at CityWalk. 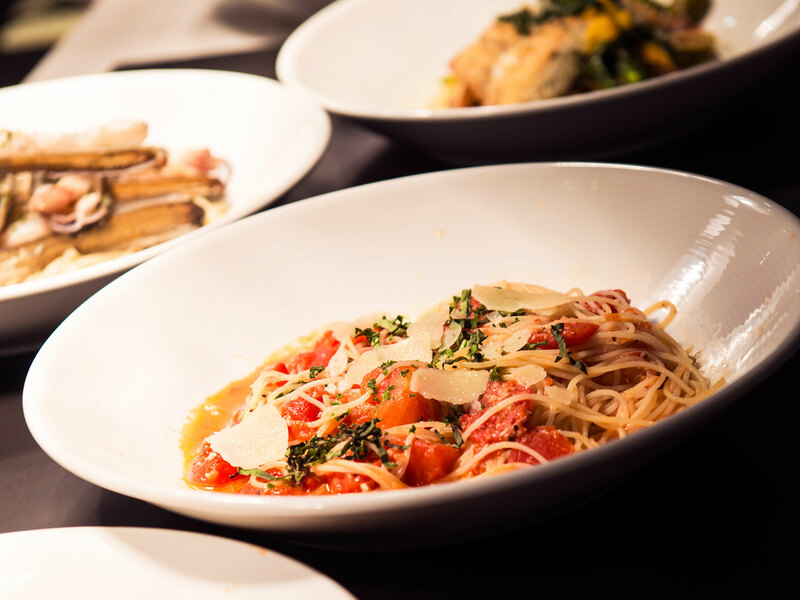 If you only have time for one meal at CityWalk, go to Vivo Italian Kitchen. This one's right at the center of everything—you may remember another Italian restaurant in this location. This is not that Italian restaurant, it's better. Step toward the middle of the venue, typically buzzing all night long, and you’ll notice a circular bar—a performance space of sorts—where fresh pasta is made, each and every day. All of the pastas, all made in-house, are good, and while plenty of people are happy to come in for a spectacular calzone to share, or a memorable plate of spaghetti and meatballs, you can also order more delicate, Northern-type fare. The often-affordable wine list is a highlight (good bottles for $40-ish, sign us up), and good cocktails start around $10. The restaurant with the most insane name ever is also insanely fun—once you figure out how to make it work for you. First of all, choosing steampunk as your theme (and going absolutely wild with it) is something to be admired. Second of all, naming your restaurant The Toothsome Chocolate Emporium & Savory Feast Kitchen—was this workshopped, at all? (Probably.) Call it whatever you want, perhaps the place with the giant smokestacks, but just call it, or call on it—you can’t miss the thing, it’s right there, on your way into Islands of Adventure. Walking in, you encounter an extravagant-looking chocolate and candy shop; to your left, there’s a soda fountain of sorts, where highly decorated milkshakes are made, the kind that were so hot last year. 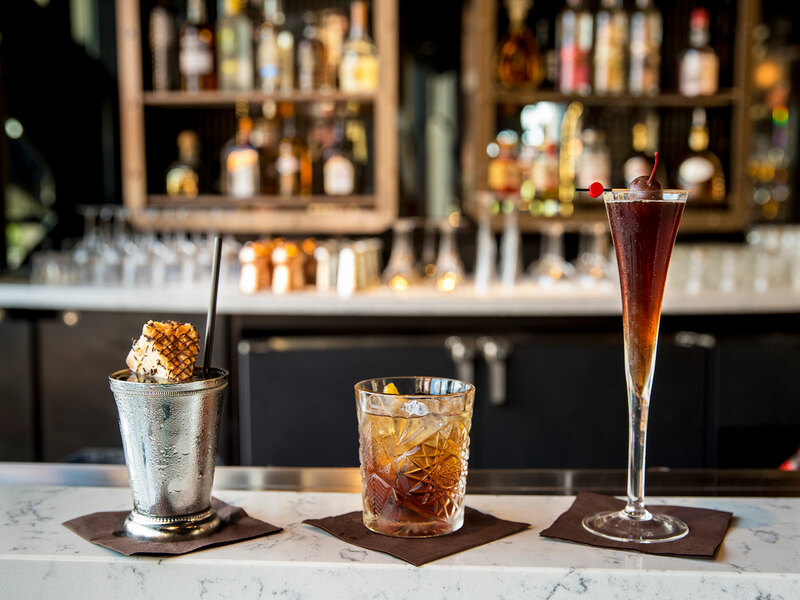 From there, you walk into the two-story restaurant, and where you want to be is upstairs, either at or near the front bar, for the best views of the various CityWalk goings-on. Start by nibbling on warm chocolate almond bread, served with a salted caramel butter, and think about where you want to go from there—more chocolate-themed hilarity, perhaps a pork belly slider served with chocolate dipped bacon and a mustard aioli, on a pretzel bun? Braised short ribs with a cocoa gremolata? If you’re feeling frisky, sure, but some of the best dishes here are just straight-up comfort food, with no bells or steaming whistles—meatloaf with Yukon Gold mash, a beautiful Niçoise salad, and a classic (hello, we weren’t expecting you!) amandine, a sole amandine, specifically, with green beans and potatoes Lyonnaise. 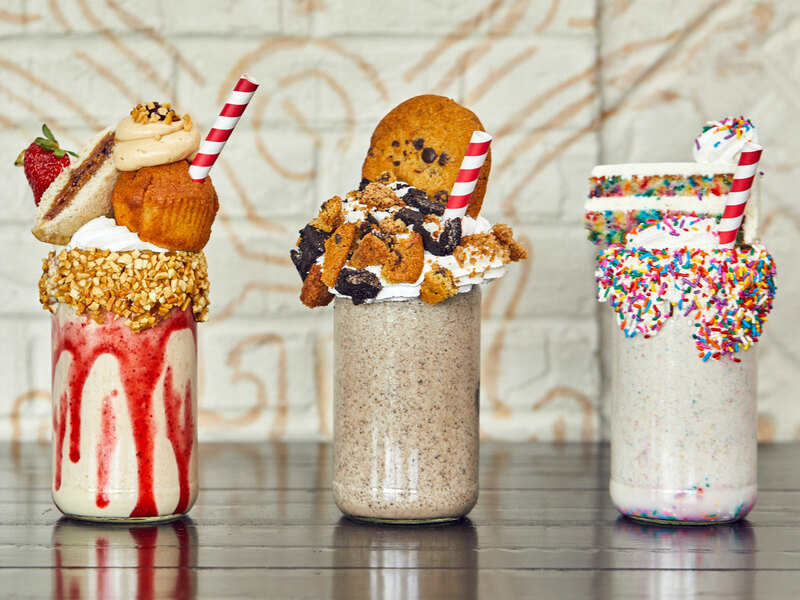 Oh, and about those shakes—yesterday's food trend news, perhaps. But they’re delicious. Need a quick bite? Look no further than one of the better pizza joints you’ll find at a theme park. Open until midnight most nights, later than that on weekends, the welcoming Red Oven (just next door to Vivo) vibes like a lot of those fast-casual pizza places, popping up everywhere, but when this one fires on all cylinders, they're putting out some of the best pies you’ll ever eat in a place like this. Universal doesn't make a big deal about it, but there’s a lot of obsessing behind the scenes about process here, just as there is all of Universal's restaurants—triple-filtered water, real-deal Caputo flour from Naples, San Marzano tomatoes, a proper, super-hot oven, it all makes a big difference, and while these aren’t strictly Neapolitan-style pies, they’re darn good, with a dusting of semolina along the bottom and plenty of imported mozzarella di bufala on top. 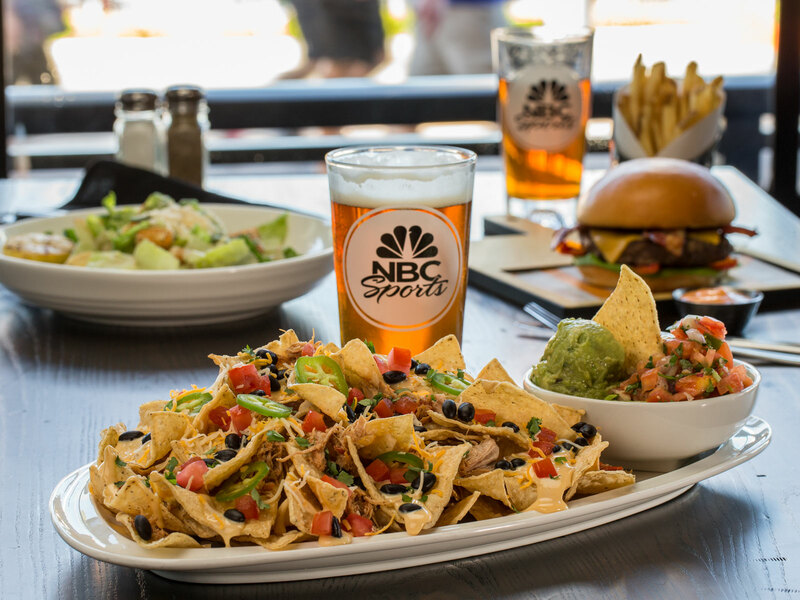 If all sports bars had menus as good as the NBC Grill, we’d spend a lot more time in sports bars. Let’s start with the fact that they’re cooking over giant grills, placed right in the middle of the restaurant, and continue on to the fact that they source a lot of really good meat from Creekstone Farms. Once again, a place that you probably wouldn’t expect, is being very serious about food, and if you've a mind to eat your way down a really good menu of appetizers, here's where you do it. Start, however, with the massive soft pretzel, served with a jalapeño queso and ballpark mustard, try the nachos if you want (they’re great), but don’t overlook the house-made kettle chips, served topped with blue cheese, a white queso, and generous amounts of applewood smoked bacon—this one's a knockout. In the mood for Mexican? Two words—baked tamales. Antojitos, the typically packed-to-the-rafters Mexican joint on CityWalk’s upper level, is much like any other Mexican restaurants of its size, doing the most for the margs-plus-guac crowd, and then it gets, in the most random, unpredictable ways, entirely serious, and it all begins with the tamales. Baked almost like fluffy little flans, they come in a pair, one filled with a picadillo of chicken and pine nuts and raisins, the other comes doused in a tequila mushroom sauce that should come in a glass with a straw. Pair these with an order of the elotes, the house version of the classic Mexican snack, roasted corn on the cob rubbed with a jalapeńo mayo, dusted in all the delicious things, and you’ve got almost got yourself a meal. Still hungry? The house fundido, made with queso menonita, a staple of Mexico’s Chihuahua state, will finish you off. Or at least it ought to.